A modeler's treasure trove of NYC rolling stock information with expert commentary. 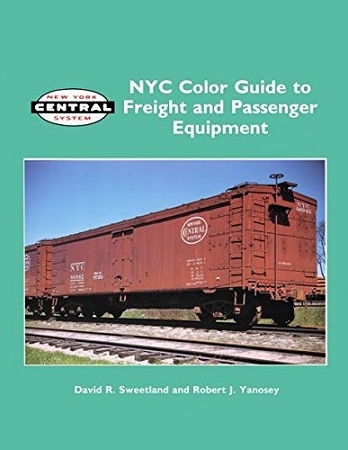 This is the first all color effort devoted to the rolling equipment of the New York Central after World War II as color film became available. The NYC evokes thoughts of the Great Steel [Passenger] Fleet, thundering freights in red and grey, work-a-day trains in boxcar red and black, and the snappy Century (”Jade”) green NYC’s last decade. This book stops the action and illustrates in color the individual pieces of equipment that made up the Central’s roster. The photos are drawn from diverse collections, in fact, many were shot “off line”. Modelers will not only see the colors, but weathering patterns. Historians will appreciate the fleet’s depth, the Central’s many traffic patterns, and the book’s expert commentary. 128 pgs., hardbound, abt. 300 color photos, copyrighted and sold at 1994’s original prices. Printed in China. NYCSHS members enjoy another 20% off, while Ohio residents should add 8% sales tax.